South Korean Unification Ministry’s spokesman Lee Duk-haeng said that South Korea calls for reopening of the intra-Korean communication channel that was cut off in 2016 after North Korea’s nuclear and missile tests. MOSCOW (Sputnik) — South Korea calls for reopening of the intra-Korean communication channel that was cut off in 2016 after North Korea’s nuclear and missile tests, South Korean Unification Ministry’s spokesman Lee Duk-haeng said on Wednesday. "The government has kept the stance that the inter-Korean dialogue channel should be reopened. The ministry has been reviewing ways to restore it," the spokesman said, as cited by the Yonhap news agency, adding that there are "no specific steps in the offing." On May 10, new South Korean President Moon Jae-in officially assumed office, stating in his inaugural address that he would do everything possible to maintain peace on the Korean peninsula, and even "visit Pyongyang if it is possible." 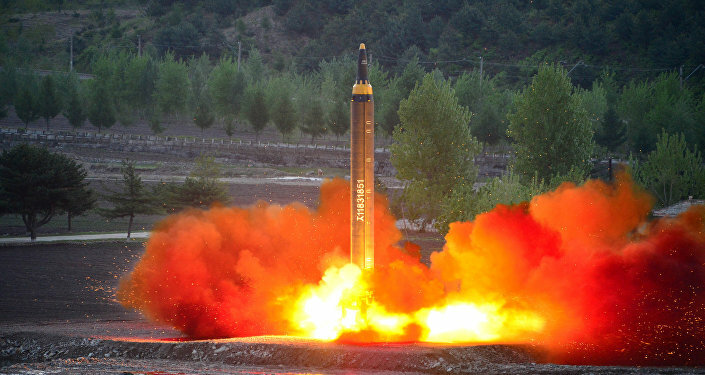 The latest North Korean missile test was carried out on Sunday, with a ground-to-ground intermediate ballistic missile falling in the Sea of Japan. On Monday, the country’s government officially confirmed the test to be successful.